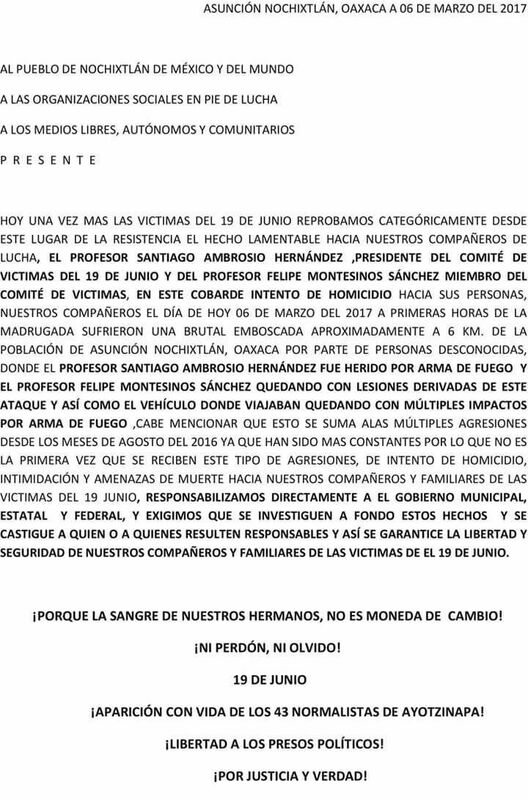 Arturo Peimbert Calvo, head of the Oaxaca People’s Human Rights Ombudsman, reported that on April 17th, while he was in the vicinity of the municipality of Nochixtlan, he was wounded and, upon leaving, he was shot at from long distance with bullets shots to the trunk and a door of the vehicle. He expressed his concern “due to the recent attacks on the victims and their representatives, for example, the one perpetrated against the teacher Santiago Ambrosio Hernandez, who on March 5th suffered an attack in which he was injured with a bullet shot to the leg.” For the same reason, he informed that protection measures were requested for those who demand justice in the case. It should be recalled that in Nochixtlan, on June 19th, an eviction was carried out by federal police against residents and teachers of Section 22 of the National Coordinator of Education Workers (CNTE), which left eight dead and more than 100 injured. On April 10th, five of eight fasting nurses completed eight days on hunger strike, and for the second consecutive day they were gagged in order to avoid drinking liquids for ten hours as part of their protest outside Rafael Pascacio Gamboa Hospital in Tuxtla Gutierrez. This protest seeks to obtain medical supplies and medicines for the more than one thousand health centers in the state, the reinstatement of several workers unfairly dismissed and the payment of quotas for pensions, insurance, savings fund, housing, etc. This quota was paid by the workers on a monthly basis (a total of 782 million pesos). On the same day, members of the National Assembly of Social Organizations-Teachers’ and Popular Movement, attended by teachers of the National Coordinator of Education Workers (CNTE), marched in Tuxtla to the outskirts of the Hospital and expressed their support for the struggle of workers in the health sector. Dozens of civil organizations have also expressed their support. The Fray Bartolome de Las Casas Center for Human Rights (FRAYBA) accepted the request of the strikers to accompany them in the process of negotiation with the state government. It should be remembered that on June 19, 2016, police elements violently suppressed teachers, and organized civil society in rejection of the educational reform bill of the government of Enrique Peña Nieto (2013). These events caused the death of seven people by firearm and another one that died as a result of an explosion; at least 226 civilians were injured. For its part, the Federal Police reported 73 injured elements. On February 17, the teacher Antonio Santiago Gonzalez, 59, was assassinated, regional representative of Putla Villa de Guerrero, of indigenous level in the coastal region of Oaxaca. Law enforcement officials reported that the teacher, who was a member of Section 22 of the National Coordinator of Education Workers (CNTE), was gunned down while traveling in his car by an armed group, who attacked him at kilometer 121, before arriving to the town of Carrizal Copala, Oaxaca. Wilber Santiago, spokesperson for Section 22, reported that the legal team of this group is accompanying the family of his partner for a quick response from the authorities. In the early morning of December 1 and in an alternate location, Alejandro Murat Hinojosa (of the Institutional Revolutionary Party, PRI) took office as the new governor of Oaxaca. The event took place in an alternate venue to the Congress facilities, which was taken over by teachers from Section 22 of the National Coordinator of Education Workers (CNTE), who also organized 37 road blocks in several parts of the state in the same context. On the same day, Murat Hinojosa announced the composition of his cabinet in which the appointment of a marine in charge of the Secretariat of Public Security, Frigate Captain Jose Raymundo Tuñón Jauregui who is also paratrooper of the Marine Corps and served as military attaché for several years in the United States is notable. On September 15, the symbolic commemoration day of “El Grito” – the cry for the Independence of Mexico – thousands of people responded to the call launched on social networks for a march to demand the resignation of Enrique Peña Nieto. In Chiapas, the governor, Manuel Velasco Coello, did “El Grito” from an alternative site to the square of Tuxtla Gutierrez, as it was occupied by teachers opposed to the education reform bill. In Oaxaca, in the state capital, the governor, Cué Monteagudo, did his sixth and last “Grito” from the balcony of the government palace amid shouts of “murderer” and “traitor”. According to Educa, “elements of the State Police prevented the entry of teachers from Section 22 into the square to give their alternative ‘Grito’ with teargas, sparking a confrontation”. At least 20 people sustained minor injuries. You are currently browsing the archives for the CNTE category.